Halve cherries and remove the pits. Halve and juice lemon. Add cherries and lemon juice to a pot and let simmer for approx. 5 min. Meanwhile, add dates and cashews to a food processor and process until smooth. Transfer the date-cashew mixture into a baking pan or springform pan. Spread and press down firmly. Add ground almonds, maple syrup, and salt to a food processor. Process until smooth and spread on the tarte base. Transfer cherries from the pot into a liquid measuring cup and blend. Add agar-agar and stir to combine. Transfer cherry puree back to the pot and let boil for approx. 2 min. more. 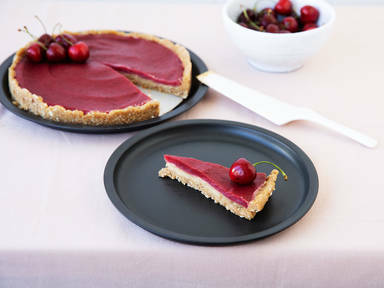 Allow cherry mixture to cool, then spread evenly into the crust. Let rest in the fridge for approx. 2 – 3 hr. Enjoy!